Continued Russian and regime bombing of Aleppo, Syria’s largest city, damaged another hospital on Saturday. Pro-Assad airstrikes, including barrel bombs and seven missiles, again targeted the M10 hospital, the main trauma hospital in the opposition-held area. 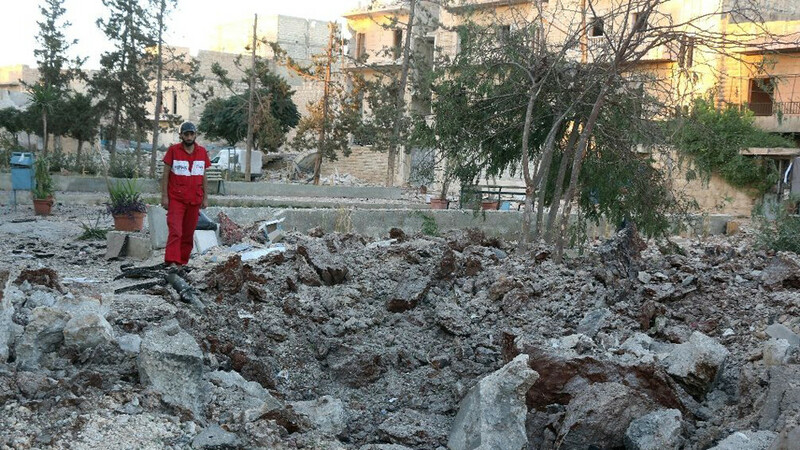 The Syrian American Medical Society said at least two patients were killed and 13 wounded. The hospital, supported by international medical organizations, was knocked out of service on Wednesday by bombing. Doctors said a few staff were present on Saturday to provide triage and basic emergency care. “The hospital is now out of service completely. There’s destruction to walls, infrastructure, equipment and generators. There are no more guards or staff left. It’s complete darkness,” said Mohammad Abu Rajab, a radiologist in the hospital. Scores of medical facilities have been struck since Russian began its aerial intervention last September to prop up the Assad regime and Syrian military. The campaign was renewed on September 19, following a brief US-Russian ceasefire, with attacks on a UN aid convoy. An estimated 500 civilians, including more than 100 children, have been killed since September 22. The Local Coordination Committees said another 34 were slain on Saturday, among 77 people killed across the country. With two hospitals knocked out on Wednesday, there are also six functioning facilities in and near Aleppo. The Red Cross says there are as few as 14 doctors in the opposition districts of the city, with only two able to carry out major surgery. “The bombing of Aleppo needs to finally stop! Whoever wants to fight terrorists does not attack hospitals!” German Foreign Minister Frank-Walter Steinmeier tweeted. US Secretary of State John Kerry called on September 21 for a suspension of Russian and Syrian military flights over areas of humanitarian need, but the demand was immediately rejected by Damascus and Moscow. Kerry subsequently said the US would cut off contacts with Russia — with whom it has pursued a political process for more than three years — but is continuing to speak with Russian Foreign Minister Sergei Lavrov. They continued discussion of the situation in Syria, including opportunities for normalization of the situation in Aleppo, where illegal armed groups, despite of the Russian-American agreements on cessation of fire by the conflicting sides, continue fighting. Many groups of the “moderate” Syrian opposition refuse to dissociate themselves from Jabhat al-Nusra terrorists, which are not subject to the cease-fire. While attacking civilian areas in the city, Russian and Syrian warplanes also tried to support a further advance to the north, tightening the siege of the opposition-held neighborhoods. Pro-Assad foreign militia and the Syrian military — having secured the Handarat camp on Thursday — attacked in the Suleiman al Halabi neighborhood and the residential Bustan al Basha quarter. Rebels claimed that they regained buildings that were briefly captured in Bustan al-Basha and that repelled attacks on the disused al-Kindi hospital. The Russian-regime warplanes reportedly bombed another water plant in support of the offensive. Airstrikes damaged power lines to the south of the city last week, cutting off water to 1.75 million people in both regime and opposition areas. Trying to raise morale, State media is proclaiming a visit by the Syrian military’s Chief of Staff to northern Hama Province, where rebels have captured a wide front of towns and villages north of Hama city. 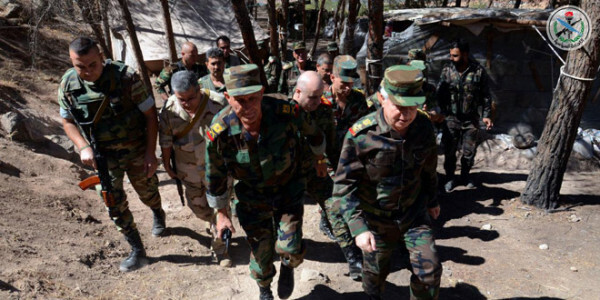 General Ali Abdullah Ayoub and officer “inspected the readiness of army units” on Saturday. Rebels began their offensive at the end of August, taking four towns and a series of villages as they closed within 10 km (6 miles) of Hama city. They renewed the advance with the capture of the fortified village of Ma’an, followed by the seizure of more territory. Syrian State news agency SANA makes no reference to any rebel gains, but says, “Ayoub provided the soldiers with instructions and stressed the need for them to maintain the highest degree of readiness to carry out their duties in the optimal manner”.